So when Google announced they were replacing it with something called the Keyword Planner, I was both anxious and intrigued. It’s never good as an SEO to rely too heavily on one tool or process, so I welcomed the arrival of a new tool to play with. The worrying part for me though was the danger of a fiddly new tool taking a big slice out of my day to do a task that I had managed to streamline and scale so well. The first time I used the Keyword Planner, that worry became a reality and I was suddenly facing a big problem in terms of agency processes and campaign planning. 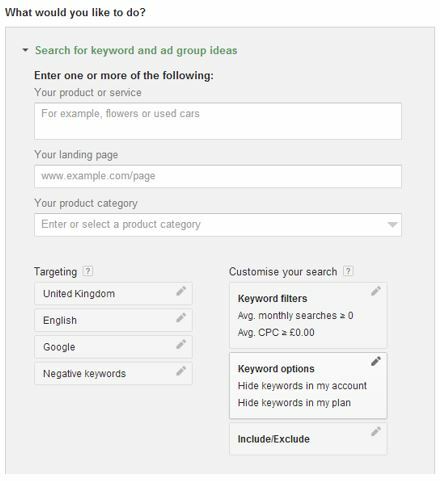 I naturally searched high and low for a good guide on using the Keyword Planner for SEO keyword research, but was not able to find one that sufficiently answered the question of how to focus it away from AdWords research and onto SEO research. There are some good all-round guides to using it out there though, in particular this one by Larry Kim at Search Engine Land and this one by Kristi Hines on the iAcquire blog. My issues with the Keyword Planner were that I couldn’t get it to produce targeted and relevant keyword ideas – because the handy tick box to ‘only show ideas closely related to my search terms’ – had been removed, it always seemed to want to group everything into adgroups for me (which might be handy for PPC but not so much for SEO research) and that I couldn’t get it to change the estimated traffic figures when I changed the match type – which is pretty essential for SEO! 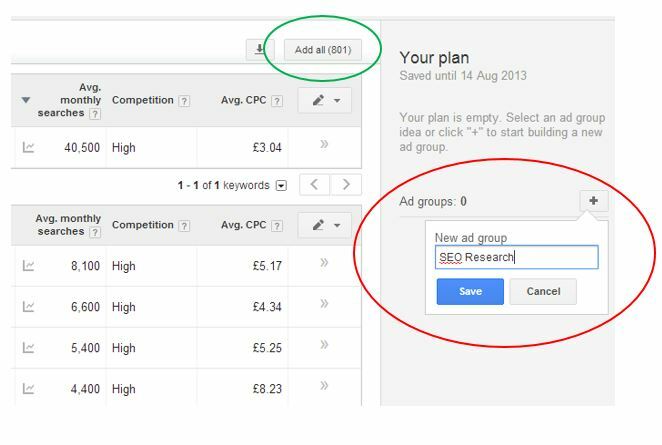 I understand why Google has made these changes – it is after all an AdWords tool – but I still needed to work out how to use it quickly and effectively for my SEO needs. I’ve only been using it for a week or so, but I think I’ve almost cracked it with the below process. I still get a lot of very broad and random keyword ideas in my CSV download, which I have to manually edit in Excel, but overall I’m pretty happy with it now. I’d love to hear how other people are using the Keyword Planner for SEO – so please do share your ideas and processes in the comments at the bottom. Stage 1 – pick the right option! If you’re starting from scratch and looking for general keyword ideas then you only need to use this first option. I’ve not really used the other two options but they don’t seem to be too helpful in terms of SEO keyword research. There’s lots of options here, but I find that I don’t really need any of them. I’ve not had to do any local-specific research yet so I just stick with ‘UK’. Since I’ve been using Keyword Planner I’ve found that it actually produces much better results than the old Keyword Tool. They’re not as well organised, more on that later, but at this stage I don’t have to enter as many seed keywords to get a good range of relevant keyword ideas. You don’t have to do this if you don’t want to. I know some SEO’s who prefer to work with broad match or “phrase match” data, but I prefer [exact match]. Once you’ve changed the match type you’ll notice the search volume figures shown within the tool don’t change accordingly – which threw me a bit at first – but I soon cracked it by actually reading what it said in the dialogue box: Add keyword as. The figures for the different match types are only accessible after I’ve added them to an adgroup. This is the needlessly fiddly bit, but it looks like it’s the only way to get the proper match type data out of the Keyword Planner. 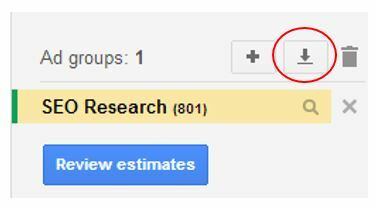 First of all I make a new adgroup on the right (red circle), and then hit the ‘Add all’ button (green circle). 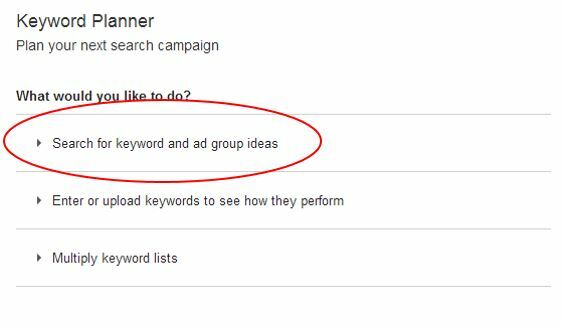 Because I’ve only made one adgroup, all the keyword ideas and the associated data automatically go into it. When you download the data now, you get a CSV with the search volumes of the match type you specified in stage 3. As I said earlier, the keyword ideas you get are much more loosely based on your seed terms – for example I just entered [seo] as my seed term and got ideas like [matt cutts] and [meta tag generator]! Not quite the sort of keyword ideas I’m after, but once I’ve edited the Excel sheet a bit I find that the ideas I’m left with are much better than the ones I used to get from the Keyword Tool. I’m still working on getting the best out of the Keyword Planner for SEO research, so will share any updates I have on my process here. If you do things a bit differently, please let me know in the comments below – for all I know I’m missing something obvious that could speed up the process!